We caught up with Laurie Carroll, gallerist, art enthustiast and founder of Procurio, to talk about buying art in today’s market. Laurie started her career as a gallerist on King’s Rd, London, in 2005. Since then she has been a gallery manager, director, owner, curator, and buyer. Her experience in all levels of art sales from e-commerce to fine art auctions has given her the broad perspective required to successfully navigate the art world. Laurie has worked with hundreds of artists, ranging from recent graduate to fully established, helping many of them take the next steps in their careers. Laurie grew up in Zurich, Monaco, and finally London, where she received her degree in Illustration and Art History. In 2010, She moved to New York City, where she founded Procurio in 2018. Procurio’s goal is to make the art world more accessible for collectors, buyers, sellers, and artists alike. Why is art important? What’s the value of living with art? Can you imagine a world without art?! What a sad place that would be. For starters, if we didn't have art, there is so much of our history that we would have never known about. Art is not only historically important, but I love how it can bring out so many emotions. I know the art world can be daunting to a lot of people, but it’s so sad when you see people's homes without art, especially when you can find amazing pieces at all price points now. Art makes a home, shows your personality and at least for me, brings me so much joy everyday. 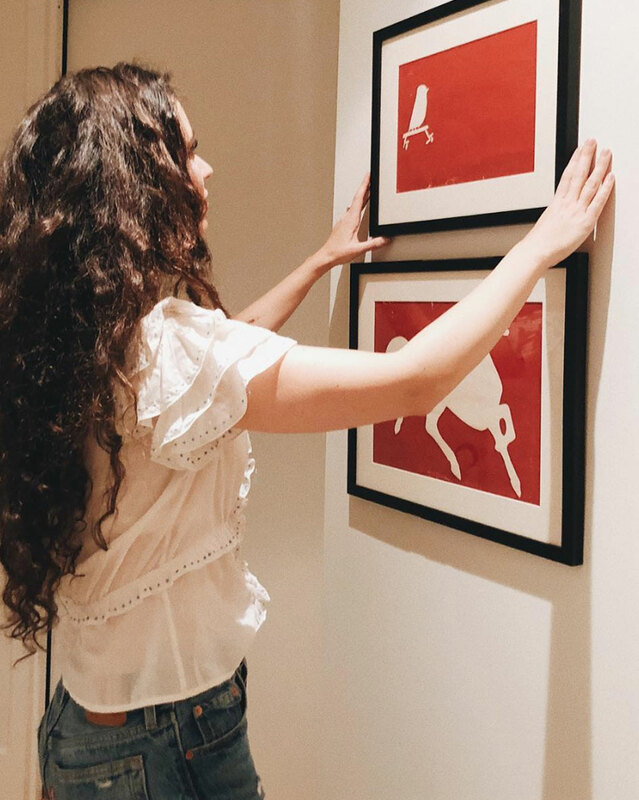 Original vs. Print – why is owning an original work so special? A print will never capture everything that is in an original; the way it looks in certain lights, the texture, the details, not to mention retaining value. If you can afford it, always go for the original piece. That being said, I worked at a company where the main business was made to order prints and it was great because it gave our artist's a huge amount of exposure, steady income and made art accessible to everyone. At the end of the day, whether you have an original piece or print in your home, the important thing is you have art on your walls! What’s the most important consideration when purchasing a work of art? Do YOU really love it? If its love at first sight it’s meant to be. Art shouldn't match your sofa or carpet because you won't have those things forever, theoretically, if you love the piece of art it will fit in any space you live in throughout your life. You're the one who will look at the piece everyday; not your friends, interior designer or even art consultant. It should bring you joy every time you see it. Alternatively, if you're purchasing a piece for investment have you or your art advisor done the appropriate research into the artists career? What do you think the benefits are of purchasing directly from an artist rather than a gallery? I have mixed feelings on this.... These days so many artists represent themselves because social media makes it possible for them to have amazing exposure. I think it can be great for clients to get to know the artist and purchase directly from them because it gives added value to the experience of buying the piece and of course, the full price of the art goes straight to the artist and allows them to keep being creative without financial stress. I also think buying from an artist at their open studio is amazing because you get to see a large body of their work and speak to them in person about their practice. I think it can great for an artist to meet the people who are taking their beloved pieces home! However, if you discovered an artist through a gallery (in the gallery, at an art fair, advertisement for the gallery), you should absolutely buy with them since they paid for the marketing or the exhibition. Even if you discovered an artist through Instagram and they have gallery representation you should reach out to the gallery, or the artist should redirect you to them. Its a partnership and they both work together. You can always reach out to the artist and chat with them about their work, but galleries work really hard on behalf of their artists and the purchase is supporting them as well. 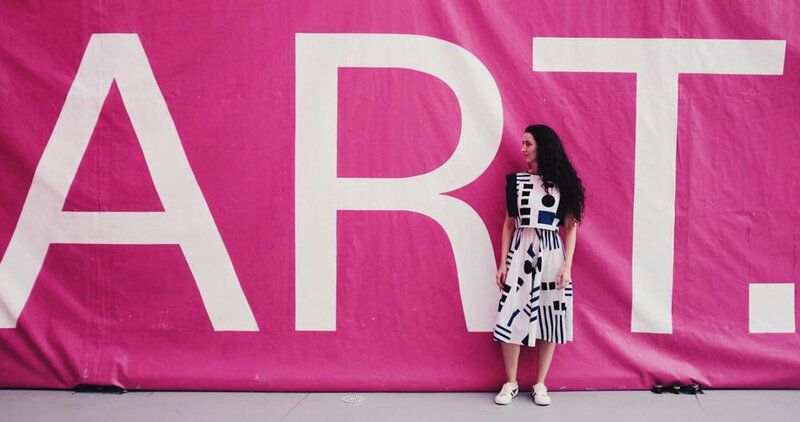 How do you think Instagram and the Internet are changing the way we purchase art? Its been really interesting to watch how the art world has evolved since my first job in a gallery nearly 15 years ago! Nothing ever beats seeing a piece of work in person, but I think being able to have all sorts of art at your fingertips has been brilliant for art sales and artist exposure. I use Instagram and other art websites constantly when I'm looking for pieces. I have found amazing artists I would never have known about if those didn't exist. I know some artists are reluctant or daunted by instagram or updating their websites, but if you have a smart phone or a computer, watch some lessons on youtube and get your work out there! If people can't see it, they can't buy it. Where did your love of art stem from? Have you always loved art? My whole family are interested in or make art, so I was surrounded by it growing up. My grandma was a collage artist and my Dad loves to paint so there was always some form of arts and crafts going on. My mom, sister, husband and I are constantly going to exhibitions whichever city we happen to be in. I'm lucky I get to spend time between New York and London so I see some incredible shows. In high school, I would volunteer to tidy the art room so I could spend more time in there; I loved organizing all the paints and brushes (I think I'm the only one who would find that fun...). I studied illustration at university so I could paint, draw and write about art history for 4 years. I never wanted to leave! What are the benefits of working with an art consultant? The art world is vast and can be daunting and intimidating to dive into. There is so much art out there, where do you even begin? Working with an art consultant is helpful because they get to know your tastes and they do the navigating for you. Art consultants are able to narrow down the search and present the client with a curated assortment of works to choose from. They follow artist's careers, have knowledge of the art market, and know where to hunt for the perfect piece on your behalf! Where can my collectors find you? Can they follow you on Instagram? If they want to work with you, how can they get in touch? You can follow me on Instagram @procurio or head to the website www.procurio.com. DM me or email me anytime! My grandma was a collage artist so I think the medium has a special place in my heart! Kristi's collages remind me of hers - they're so layered with amazing materials, you can never get bored of looking at them! This piece instantly grabbed me with the quote "Trust the timing of your life" tucked under the bumblebee. That is something I had to keep telling myself when I decided to go out on my own as an art consultant. The planets had aligned for me and I had to trust the timing to pull the trigger. Also, who doesn't love a gucci scarf? The stripe series have always been one of my favorites; they're simple but still make a huge impact on the wall. This piece is a great one for those who want to make a statement but need softer colors. Kristi's prints are so well done and come in beautiful frames its a great option for those who want to fill a large space on a budget! I'd put this one above a bed, its dreamy! I loved Alexander McQueen and this piece reminds me of some of his fabulous prints. Again, this piece is the gift that keeps giving! Every time you look at it there is something that will peek out that you didn't notice before. I love the dark colors in this piece and they're perfectly complimented by the hot pink frame that radiates off them. I've seen people react to it's sister piece Blooming #4 and it was literally like moths to a flame. Their eyes would light up and they would immediately be drawn into what was going on in the center of the kaleidoscope and then work their way out.